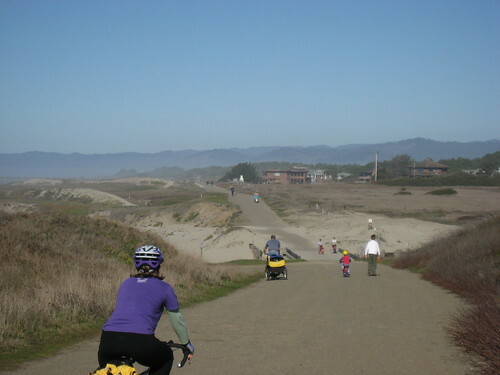 I’ve written before how great it is to get a boost on your way out of the City with your bike. Last month we went on a great trip south with a group of friends. They all started out right from the City on Friday and Saturday, but I had Sunday Streets to attend and attend to so we caught up with everyone in Capitola via Cal Train and the VTA # 17 bus. 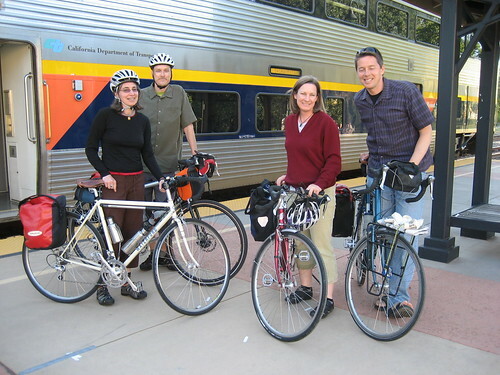 Cal Train is super easy; ride to the station, lift your bike up 3 steps into the train and go. No bumping problems on this weekend afternoon. 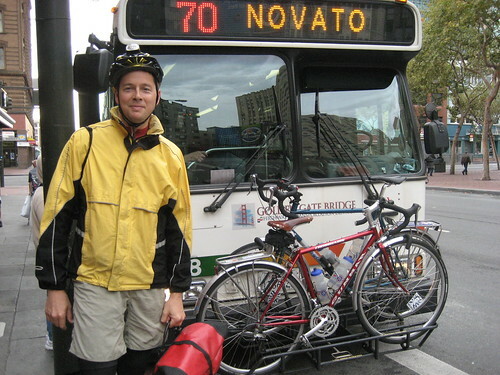 The connection to the VTA #17 (equipped with a front rack which holds 3 bikes) is right at the San Jose station and the ride over 17 is fast – just don’t watch your bikes bouncing along on the front rack. Get comfortable with using the front of bus bike racks – they really extend your range for car lite vacations and getaways. 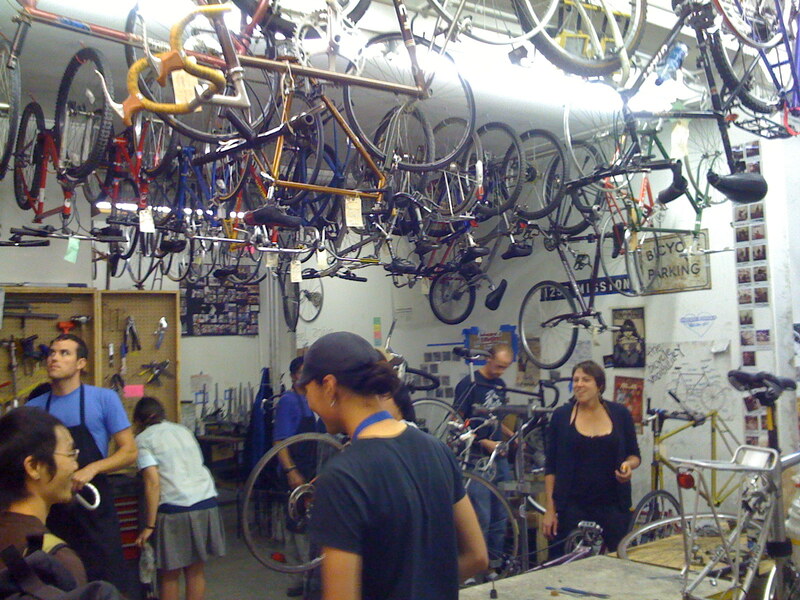 We’ve never had a problem with a bike coming loose or being stolen – although I hear that can happen in SF – and if it rains your bike gets a power wash. Just remember to take off anything you don’t want wet or possibly lost over a bump. I cover my saddle with a plastic bag, remove the water bottles and seat pack and, of course, remove my panniers. A few weekends ago we decided that it would be nice to get out of the city on our bikes. 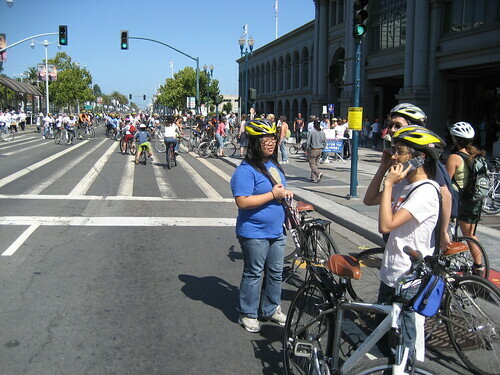 In order to get further then I can pedal out and back in one day, we ride our bikes to 7th and Market and hop on the Golden Gate Transit bus with our bikes and ride back to the City. 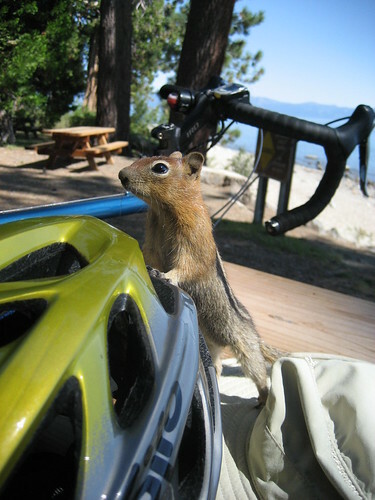 How far we go is limited by by how long we can sit on the bus, and how far I can pedal home. 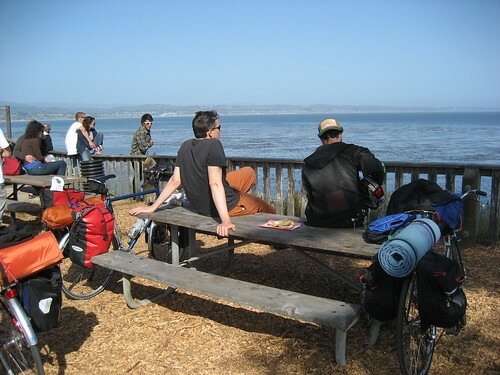 On this trip we got off the 70 at Lucas Valley Road and rode through China Camp, had lunch in San Rafael, and then rode on home to SF. Now that the election is over I feel like I can breathe again. 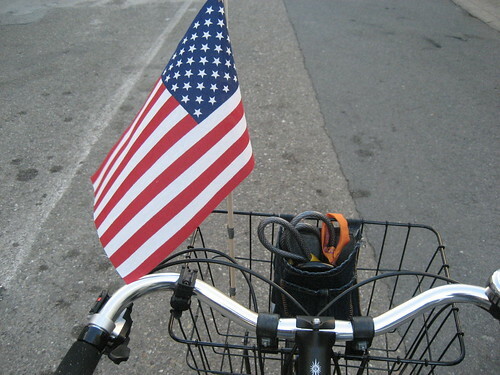 Thank you Velo Vouge http://velovogue.blogspot.com for appreciating my flag laden bike on election day. That’s my lock pocket in my basket. Helps me know I always have my lock and cable when I head out the door. The orange ribbon keeps the cable from bouncing out of the pocket after particularly nasty potholes, saving me from throwing myself in front of traffic to get my cable back. On Market Street. During rush hour. In August 2008 my wife gave birth to our first kid. We named him Paulo. He’s pretty awesome. In the 6 weeks I had off from work (just went back this Monday), I spent my time walking around downtown to get him to take his naps (he’s one of those urban babies who just wants to be a part of everything, like he doesn’t want to miss out on what people are talking about). 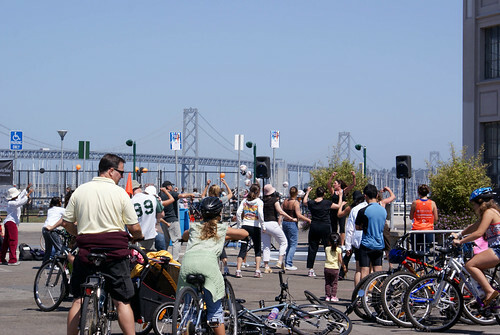 I would throw him in a sling and cruise around Union Square, the Financial District, the Ferry Building…one time I even walked all the way up Hyde Street from Post Street to Fisherman’s Wharf. Walking around really made me rediscover what a cool city we live in. Most of the time I’m stuck in the Tenderloin dealing with open crack sales and public defecation, but just by walking over Nob Hill, I was reminded that San Francisco is one of the most beautiful cities in the U.S. The views are amazing, the local businesses are unique, the architecture is stunning, and when the streets are clean, without traffic, the neighborhoods feel so livable. Seriously, you can’t really experience all S.F. has to offer unless you get out of the car and walk around. Luckily, the city is one of the most walkable places in the nation, so you really don’t have any excuses to be lazy. Once you live without a car, or with little car use, your tolerence for sitting in or driving an automobile goes way down. For starters, they go so fast and feel quite dangerous. Then, there is the feeling that you are missing so much – zipping by at 50 mph or more. There is life going on out there, interesting things to see and all you can do is watch out the car window like a trapped hound. But, this being the west there are wide open spaces that beckon. State Parks to be explored, hikes to be taken, places you just can’t get to very easily without the gasoline powered four wheels.